Since captaining the GB Under 20’s to a bronze medal in Tallinn, Liam Kirk returned to the old routine at Peterborough Petes and has been back among the points. Two goals in his four games since returning has got him back into the swing of things, but the season continues to be a frustrating one for Rob Wilson’s men. In four games since Kirk came back from Estonia, it’s been three losses and one win, which came on Wednesday night at home to Hamilton Bulldogs. In terms of the play-offs, Petes are eight points ahead of ninth place Barrie Colts in that race for the top eight in the Eastern Conference. And they’ll have the chance to close the gap between them and Oshawa Generals when they meet in a double header this weekend. 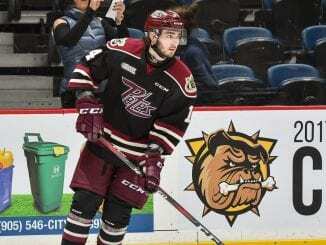 But, going back to Kirk’s return, it was a home visit by Saginaw Spirit, but the Petes were edged 5-4 in a well fought game as Max Grondin scored twice for Rob Wilson’s men. Kirk got four shots on goal, but couldn’t get a scoring return to action as the team couldn’t build on their previous win against Sarnia Sting. 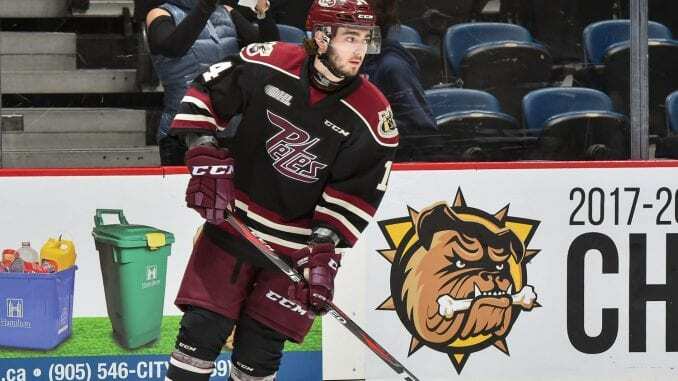 The next night, the Petes were on the road to Sudbury Wolves and again found themselves on the losing side for the third time in four meetings against them. Adam Timleck scored a hat-trick for Peterborough and although both sides were level at 2-2 up till around five minutes from the end of the period, Wolves struck three times to put the game beyind them. 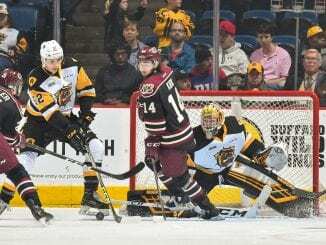 Kirk scored Petes’ fourth with a diagonal shot that flew into the net at Wolves goalie Ukko-Pekka Luukkonen’s blocker side, but in the end, it was a mere consolation. The third game of the weekend was a lot more sobering for the Petes as they fell to a heavy 8-2 loss at Sault Ste Marie Greyhounds. Chris Paquette and one from Timleck were the highlights from another disappointing game, to end the three-game weekend stretch on a sore note. However, Peterborough bounced back with a 6-3 over Dave Matsos’ Hamilton Bulldogs at home, as Kirk got the insurance fifth goal to take his tally to 16 for the season. He came out of the penalty box after serving a two-minute high stick offence and helped out team-mate Grondin near the right side corner, before moving the puck into a more central position and lashed it top shelf. It was a big win as Petes beat last season’s champions Bulldogs for the third game in a row, with Kirk netting again against them, as he has done in those previous two wins. Next up, the Generals at the weekend and the chance to build on that as the regular season heads into its final 20 games.